One cartoon stood out during the remembrances of economist Uwe Reinhardt, who passed away last week. Drawn by his children, and published in his 1987 paper on financing health care, the illustration shows two ways to feed birds: give them birdseed or give a horse birdseed and let the birds eat what remains post-digestion. The cartoon was striking to me because it also describes the difference between California’s progressive economic vision, and the vision behind the Republican tax plan passed this week by the House. Over the past six years, California enacted a set of 51 policy measures addressing workers’ rights, environmental issues, safety net programs, taxation, and infrastructure and housing. In the same way that the first feeding method directly provides seed for the bird, these policies directly assisted Californians by raising the state minimum wage, expanding access to health insurance, funding education and health care through taxes on the wealthy and corporations, and enacting ambitious environmental regulations to combat global warming. In contrast, the Republican tax reform package currently working its way through Congress mirrors the second feeding method. At its core, the Republican plan consists of massive tax cuts for large corporations and the wealthy. In the cartoon, this is represented by the bowl of oats given to the horse. Republicans claim that the infusion of tax breaks for the rich will boost economic activity and create jobs, just as the horse, after digesting its meal, leaves behind a few oats for the bird to eat. So which vision should form the basis for our economic policy? Aside from the obvious, disqualifying indignities inherent in the Republican plan and second bird feeding method, my recent study by the UC Berkeley Labor Center has shown that California’s model simply works better. The study shows that wages for low-wage workers have grown faster in California than in Republican-controlled states, wage inequality has declined modestly in California while remaining unchanged in Republican states, and a greater proportion of Californians now have health insurance compared to Republican states. California is also on its way to meeting its ambitious 2020 carbon emissions reductions goals. At this point, Republicans typically counter that these policies come with negative side effects on jobs and the economy. They argue that the only way to deliver benefits (the bird seed) to the people (the birds) without causing economic harm is to first launder aid through corporations and the rich (the horse). But here again the Labor Center study suggests the superiority of California’s model (feeding the seed directly to the birds). 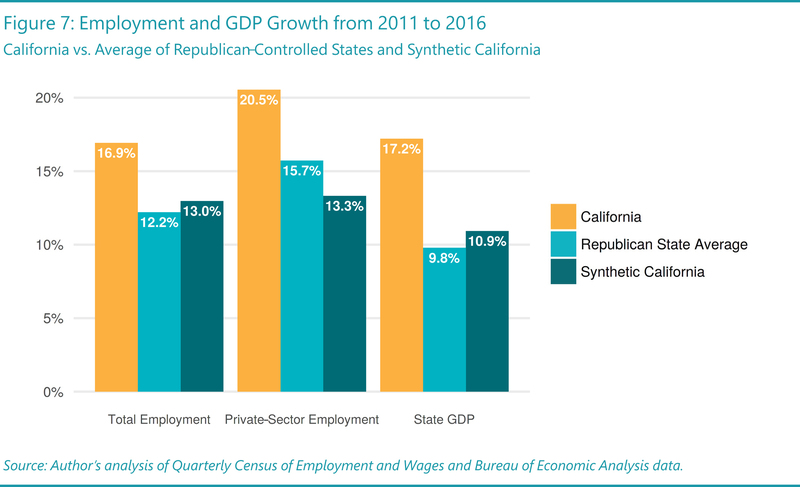 Employment growth and GDP growth since 2011 have been higher in California than in Republican-led states, showing no evidence of a negative effect on California’s economy or job growth from its progressive policies. Furthermore, the study’s findings remain unchanged even when using a statistical model known as a synthetic control that gives more weight to the Republican states most similar to California, simulating a comparison of California to a version of itself that did not follow the progressive policies. The study makes clear that the choice between economic models, like the choice of how to feed birds, is actually quite easy: it is better to follow active economic policies that directly provide aid to workers, residents, and the environment than it is to wait for benefits to trickle down from the wealthy. Not only does California’s model deliver more seed to its birds, but it thankfully also avoids the messy compromises of the Republican alternative.